Bellevue, considered by many critics to be Prague's premier restaurant, is set in a chateau-like building in the Old Town, overlooking the Vltava River. 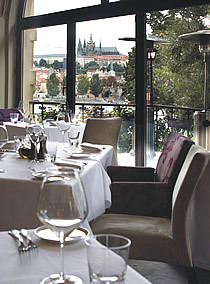 Bellevue Restaurant serves superb cuisine in elegant surroundings, whilst affording diners views of Charles Bridge, and of Prague Castle across the water. The interior of Bellevue (beautiful sight) mixes modern with traditional design, providing a crisp but warm setting with a sense of the formal - the contemporary beige and purple colours in the furnishings work well with the crystal chandeliers. The food is exquisite. The menu offers a selection of expertly prepared fresh fish and succulent meats for main courses, a sublime choice of starters, and sumptuous desserts, all beautifully presented. The wine list includes classic International wines and Champagnes, but don't ignore the local Moravian wines - Bellevue stocks some of the finest Czech wines in Prague, superior to a number of the speciality wine shops. Bellevue Restaurant also takes pride in matching wine with its food, so diners may wish to consider the optional wine pairing with each course. During the summer a terrace opens at the side of the restaurant, for guests to enjoy al fresco dining near the river. Heaters provide warmth on chilly evenings. In summary, Bellevue offers a fine dining experience: excellent service, terrific cuisine and some of the best wines in Prague. Two other best in class restaurants which offer a similar dining experience are: Mlynec Restaurant and V Zatisi Restaurant. A quiet, refined restaurant serving superb cuisine in delightful surroundings, Bellevue will suit groups of friends, families and business occasions. Advance reservations are essential.